• Provide an option to adjust construction schedule. Performance evaluation can also help us to improve construction efficiency and settlement predictions for future projects. The application of some instruments in determining settlement behavior will be discussed here, but details of instrumentation are not provided. Settlement gauges like gauges of hydraulic type, used to measure long-term deformation at actual ground surface which lies below permeable blanket provided during construction. These gauges are usually placed just after installation of vertical drains. Following figure typical layout of basic instrumentation installed during embankment construction on ground that is modified by vertical drains. Depending on existing site conditions, different configuration may be required. The requirement of monitoring is also influence this configuration. Settlement plate is installed to record readings of initial settlement. A benchmark is required in this purpose and it is set up conveniently on the stable ground at a suitable distance from fill. Settlement plate is the most popular settlement monitoring instrument. The construction of it is very simple and reading can be taken manually.But automated recording with electrical sensor can be installed which can be monitored from remote place. Settlement plates may be used to monitor heave too. It may be installed alone or may together with other instruments like piezometer, alignment stakes. As base platform of settlement plate generally plywood is used but concrete pad or steel plate may be used. A riser pipe known as reference rod is attached to platform; a threaded connection at the end of reference rod is used. This threaded connection allows to extend pipe with the progress of filling. This plate can be placed at any elevation of filling of our interest but generally they are placed above existing ground. A protection pipe of PVC materials can be installed around riser pipe where extra protection or high accuracy of reading is required. Level points are installed at the top of embankment after completion of construction. Thus settlement can be taken at any interval of our interest, say weekly or monthly when settlement rate is high under the influence of vertical drains. When settlement rate is low, say preloading without any type of drains, settlement record is less frequent. Settlement value can be computed by using the Asaoka method. Let’s discuss about alignment stakes, they are installed when construction of fill is started. There are placed parallel to slope of embankment.They offer us a simple way to monitor lateral displacement of foundation soil while progress of construction. They could provide us early warning of imminent bearing failure, even under visual inspection of construction site. The rate of this movement is related to rate of change in pore pressure below the embankment. A better alternative of alignment stakes is inclinometer. This sophisticated instrument can measure lateral displacement in borehole. 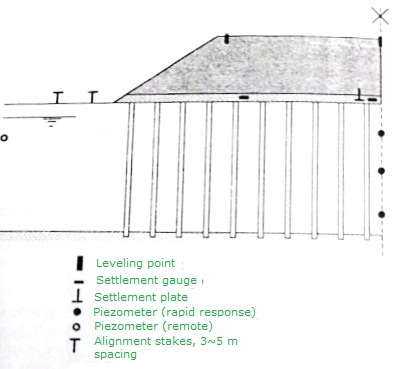 Piezometer cannot directly measure settlement, but pore pressure record is required to analysis stability in respect to effective stresses especially when surcharge is applied on foundation soil to achieve consolidation. To monitor overall process of consolidation, settlement records seems to be more appropriate and reliable than application of piezometer. Several piezometers can be installed in single hole at different depth to determine pore pressure at different depth. But each piezometer must be separated from other by bentonite plugs. Bentonite is used to achieve impermeable plugs. Ground water level is recorded by a remote piezometer. Piezometers are required either just after or during installation of drains. For detailed guideline, reader can read articles of preloading by Mieussens and Magnan (1980).